The circle represents spirit. It has no beginning and no ending. It is the spark of life that is in everyone. It is that immeasurable factor that is in all life, both animate and inanimate. The crescent or semicircle represents the soul. This is a non-material part of humans and contains the sum of all experiences gained during lives in a physical body. ​The cross represents matter, the physical form of the three-dimensional world. It is our physical bodies and all parts of life that have physical structure. It is the outer life we live on Earth. In this section, pictures of art show the nature of each planet. Captions describe the pictures. When interpreting a horoscope, an astrologer looks at the nature of each planet in the sign of the zodiac and astrological house it occupies as well as aspects between the planets. 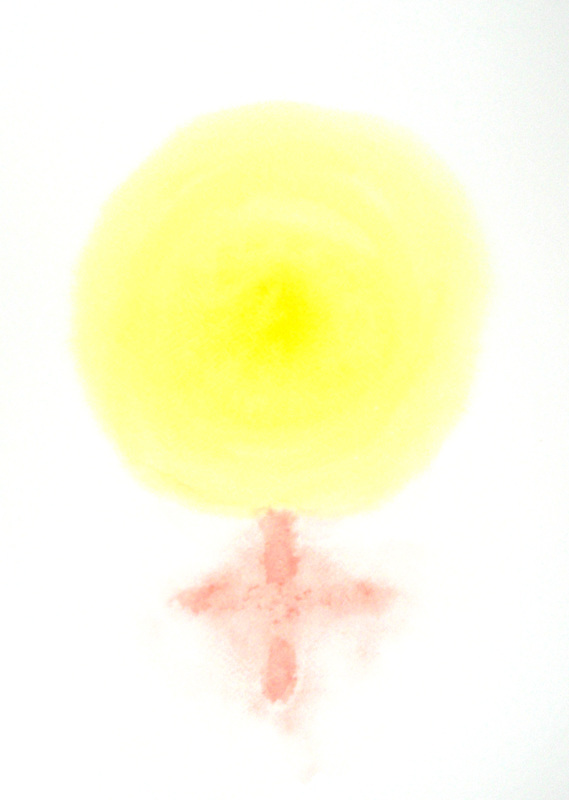 The symbol of the Sun represents spirit. Like spirit, the circle has no beginning and no end. The dot within the circle in the symbol of the Sun may be considered to be that part of the whole that is manifest in a physical body. This picture is subtle. 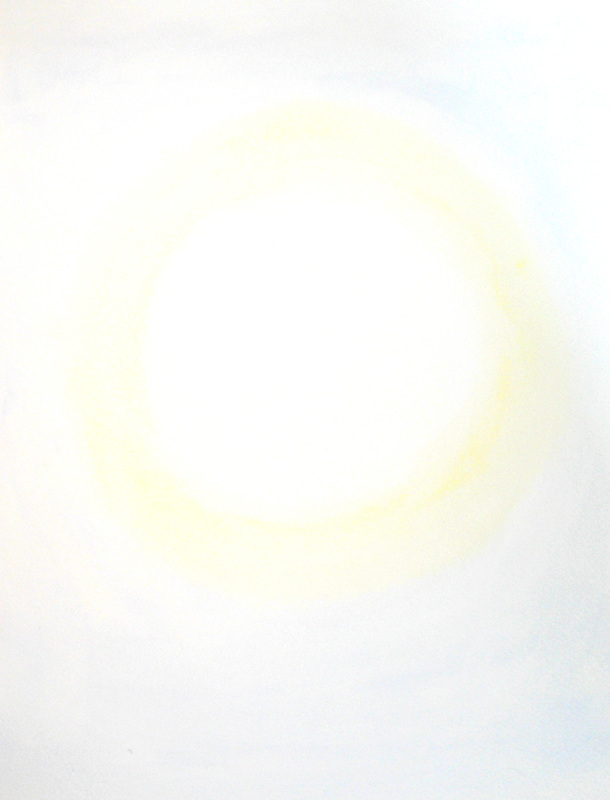 Spirit can’t be seen but it is all around so here is the Sun, symbol of spirit, shown as a golden circle that blends into the pale blue background. It is light merging with light. The symbol of the Moon is two conjoined crescents. It represents the soul and psyche and consequently is associated with the personality that is expressed in this incarnation. The symbol of the Moon focuses attention on the non-spirit and non-physical part of life. The Moon is not a planet but it orbits planet Earth. In this picture, the two crescents of the Moon face each other, emphasising that the Moon reflects the light of the Sun. The Moon symbolises the past so it reflects back conditions that have passed. 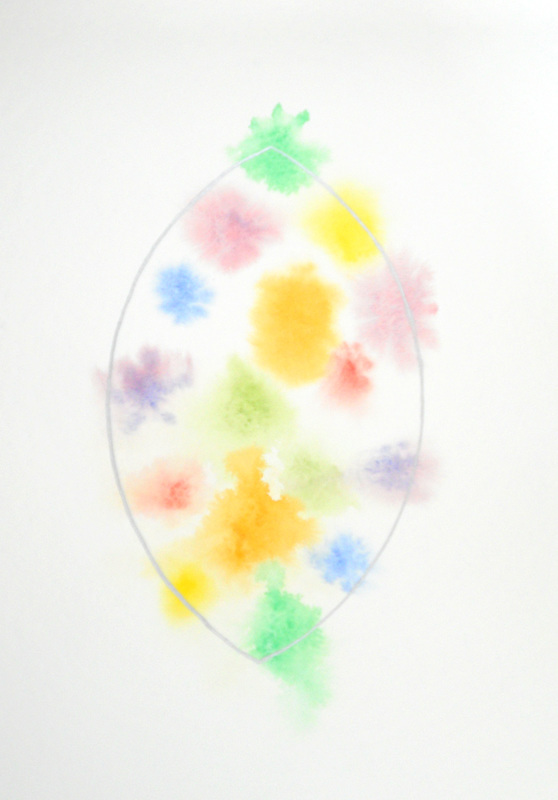 The diffuse shapes of many different colours represent changeability, a quality of the Moon. The Moon represents the soul which changes continually in response to circumstances and feelings. The symbol of ​Mercury shows the crescent of the soul above the circle of spirit which is above the cross of matter. Spirit is like a bridge between matter and the soul. Mercury is linked with conscious coordination of body, soul and spirit and the means of communication between different parts of life. 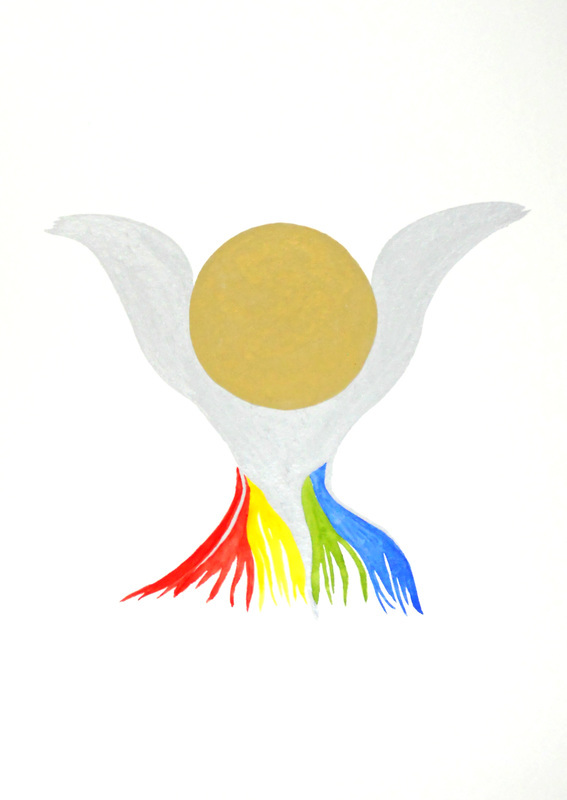 In the picture, the circle of spirit is represented by the golden circle that reaches down to the black circle representing matter at the bottom of the picture and upwards to the silver circle representing the soul. 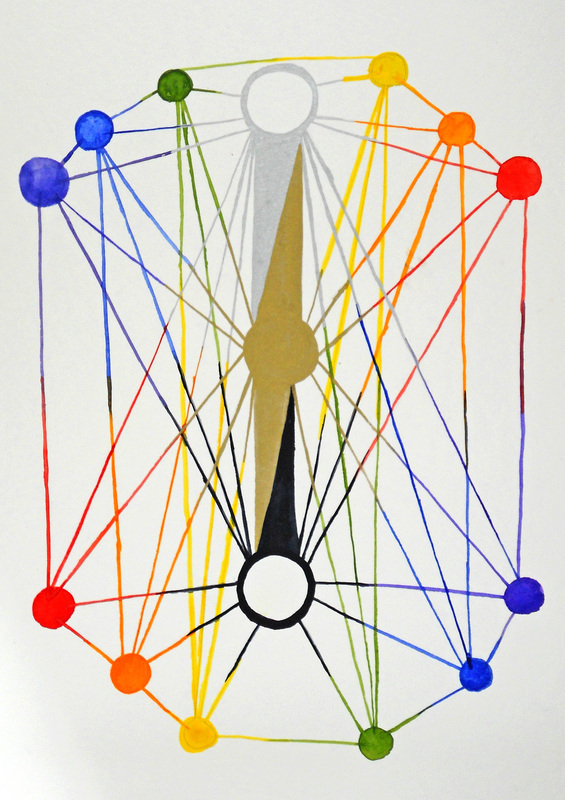 The coloured circles are linked across all levels.This illustrates how Mercury is associated with communication and connecting pieces of information and people. The symbol of Venus represents the cross of matter rising into the circle of spirit. It is the longing to rise from physical life into the state of beauty and love of spirit. In the picture, the diffuse pink cross at the bottom of the picture represents the complexities of physical life. This cross is at the lower edge of the glowing circle of light, representing spirit, which is more concentrated at its centre, at the Source of life. The glyph of Mars shows the circle representing spirit rising into part of the cross of matter. This is the spiritual fire striving to manifest in physical life. The semicircle, representing the soul, on the left hand side of the glyph, is rising above the cross of matter. It can be likened to the soul wanting to expand beyond physical limitations. This picture shows the cross of matter but each arm expands at the end. This, together with the radiating silver lines, creates a feeling of expansion. While the picture is obviously a cross, it brings a more ethereal feeling like the growth of the soul. The crescent, representing the soul, is striving to push up through the burdens and responsibilities of matter, the cross. By doing so, it learns to be careful, methodical and disciplined in its approach. 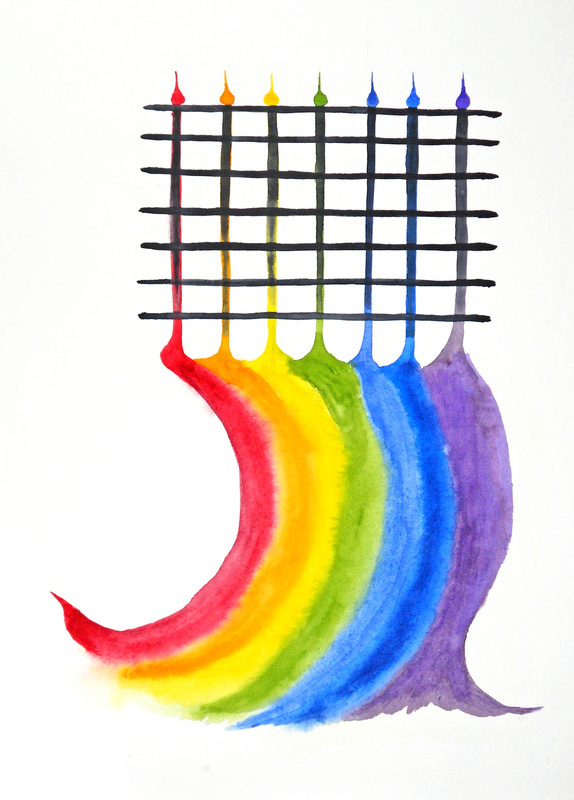 The soul is depicted by the crescents in each colour of the rainbow, representing the many experiences that the soul goes through. Each crescent is linked with a series of crosses above it. These are the lessons of life in a physical body. Above this, there are small areas of pure colours of the rainbow. These represent the wisdom and soul growth gained when each lesson in physical life is mastered. The circle of spirit is rising into the cross of matter but within the context of the perfectly balanced soul, two equal crescents. The circle of spirit is too big to get into the picture so only the top part is shown at the bottom of this picture. 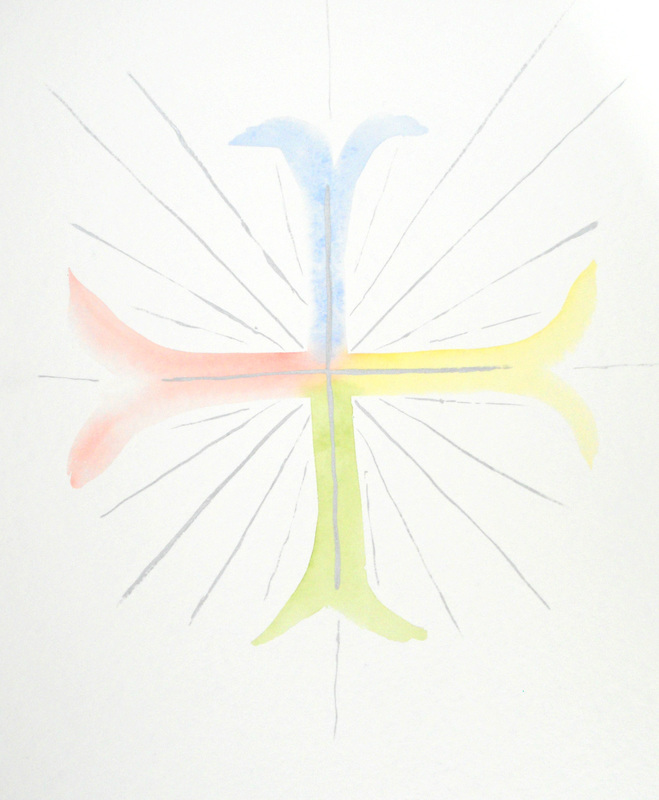 The yellow and purple arrow and two rising silver strokes represent a stylised and unusual cross.The red and green crescents facing away from the centre show the soul looking out into life to gain experience and truth. Uranus is associated with the unusual, different, original and, in more extreme cases, radical. The circle representing spirit is striving to rise into the cross of matter and then into the crescent of the soul above matter. The diffuse blue circle at the bottom of the picture represents spirit that is striving to permeate both matter and the soul. The box of four strong colours depicts the physical level of life and the cross of matter. 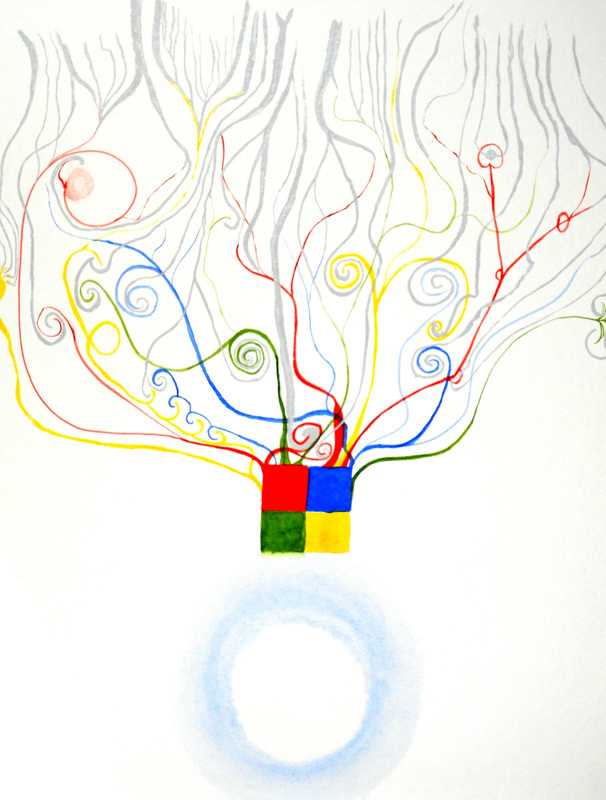 The coloured, curly lines above the box represent the body reaching up towards higher realms of life. Silver lines coming down from the top of the picture represent inspiration coming from higher realms to the soul and person. 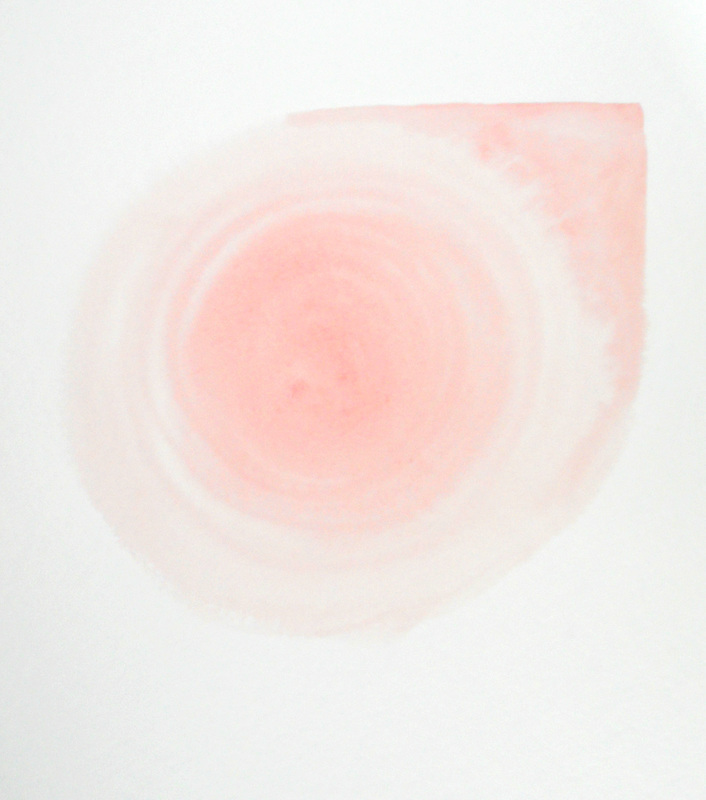 The circle representing spirit is cradled by the crescent that represents the soul. This is above the cross that symbolises matter. The four strong colours at the bottom of the picture represent the rootedness of the physical plane of existence and the busy-ness of human life. The silver area depicts the soul. Cradled within this is the golden circle that represents spirit. There is a strength of purpose in this picture just as Pluto is associated with power. The stillness in the gold and silver parts of the picture express the dynamic stillness of the soul upon transformation to be one with spirit.